Sony Ericsson has just joined the Open Handset Alliance and claims that Sony is preparing an Android Phone for mid-2010.This is Sony Ericsson G703 which was designed by Xell from Esato community. This android concept phone combines features of XPERIA and HTC G1. 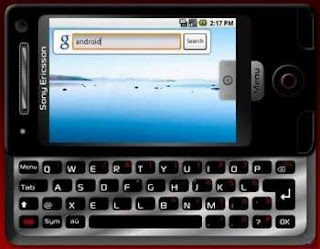 Sony Ericsson G703has QWERTY keyboard and full list of Google web applications. Sony Ericsson Mobile Concept seems to be launched in the next year 2011. The mobile phone companies are creating more compition among them relasing new handsets and smart fourth generation mobile concepts. These mobile concepts are amazing. But I always prefer sony ericsson mobile phones as the camera quality is the best.